Differential Equations can be thought of as "the task of integration, with (more and more) complications". Simple algebraic integration of a function f(x) can be re-interpreted in terms of this integral being the solution of a differential equation y' = f(x), and our task is to solve for y - as integration is the "inverse" operation of differentiation, we see that y is the algebraic integral of f(x). The equation y' = f(x) is the most basic differential equation possible. Quickly we are lead to investigate more complicated forms of equations involving differentiation, for example: y' = y + f(x), which asks: find a function y = y(x) which has the property that its derivative y' is equal to itself y added to a function f(x). Not an easy question before starting the Differential Equations course, but upon completion of this course, such questions - and exponentially more difficult and complex such equations - are answered with skill and understanding. 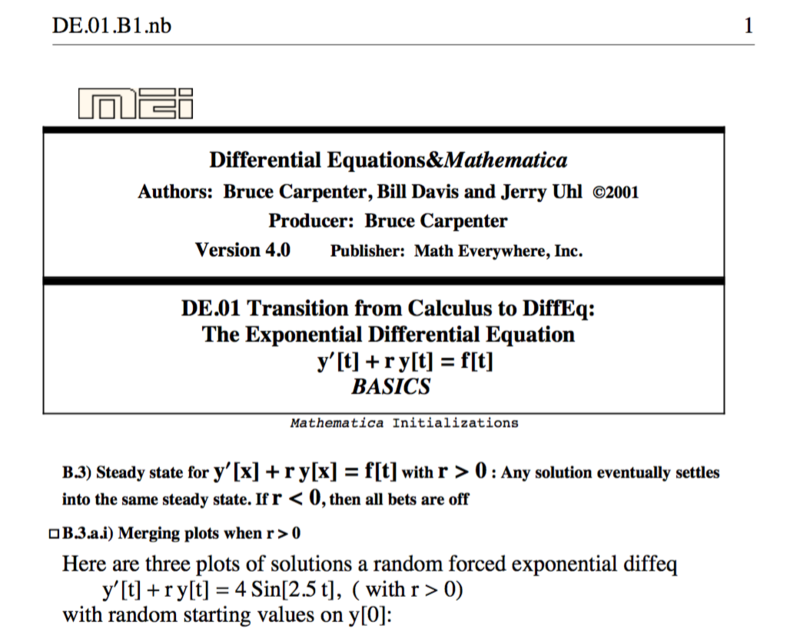 More than just an "algebraic game involving integrals", the topic of Differential Equations studies not only the algebraic solutions of such equations (when possible! ), but also the qualitative understanding of the properties and solutions of these equations. Traditional Differential Equations courses often are dedicated to learning these "expanded integration techniques" to study the solutions of these equations purely from an algebraic point of view. While this approach has its merits, the types of differential equations encountered "in the real world" (i.e physics, chemistry, engineering, etc) require solution and analysis techniques beyond what is possible via algebra alone. 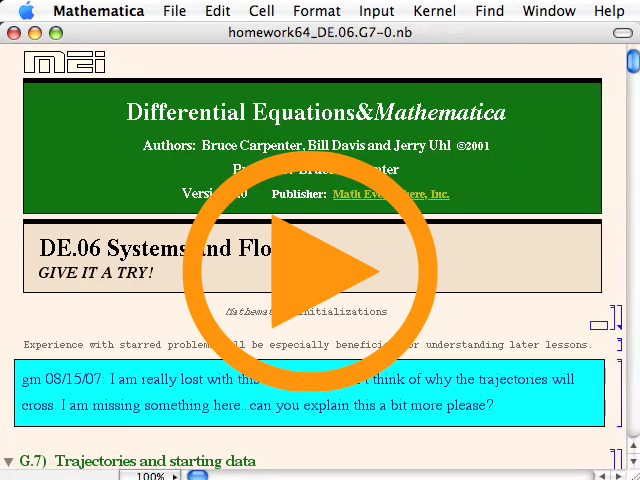 The course curriculum is Differential Equations&Mathematica by Carpenter/Davis/Uhl, and utilizes the high-powered computer algebra and graphing system Mathematica™ by Wolfram Research. Engaging the algebraic investigations of the classes of differential equations studied on briefly, the curriculum moves quickly to investigating the much richer concepts accessible via Mathematica™ and its numerical and graphical differential equation solvers, opening up the introductory study of differential equations beyond the traditional textbook on the subject. Below are some PDF "print outs" of a few of the Mathematica™ notebooks from Differential Equations&Mathematica by Carpenter/Davis/Uhl. Included as well is an example homework notebook completed by a student in the course, demonstrating how the homework notebooks become the "common blackboards" that the students and instructor both write on in their "conversation" about the notebook. That Looks Like Programming Code! Yes, Mathematica™ is a syntax-based computer algebra system - i.e. the instructions to generate the graphs and computations look like a programming language code (which it is). This course is not a course on programming. We do not teach programming, nor do we expect the students to learning programming, or even to know anything about programming. The mathematics is what is important in this course, not the code. With that tenet in mind, the authors of the Differential Equations&Mathematica courseware have designed the explanation notebooks (Basics & Tutorials) and the homework notebooks (Give It a Try) in such a way as to make it easy to Copy/Paste from the explanations into the homework notebooks, and make minor changes (obvious ones) to produce the desired similar (but different) output. In this way, we are able to stick strictly to the mathematics at hand, and deal with the programming code as minimally as possible.